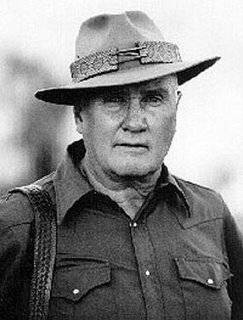 Back in the early 80’s I recall reading in Guns and Ammo magazine where the late great Colonel Jeff Cooper was lamenting the fact that many new students were showing up at his Gunsite Academy with new double action 9mm pistols or “Wonder-Nines” as they were then called. Those who are familiar with Colonel Cooper know that he was probably the greatest modern-day proponent of the Colt .45 semi-automatic pistol. Not since General Blackjack Pershing commented that he wanted one issued to every soldier in the American Expeditionary Forces of the Great War had anyone extolled the .45’s virtues like Cooper. In fact, when I first started reading Guns and Ammo back in the mid-1970’s Cooper was sort of a rebel. Almost every article was written about the Smith & Wesson K-38 Masterpiece in .38 Special, the S&W Model 19 in .357 Magnum or the .357 Magnum Colt Python. The 1911 pattern .45 ACP pistol was pretty much only manufactured by Colt and was considered by everybody except Cooper to be inaccurate and unreliable with too much recoil. My how times have changed! 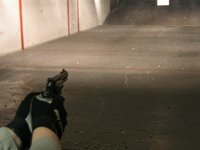 Cooper was pretty adamant that the 9mm cartridge did not have the power necessary for a combat pistol and he was equally disdainful of double action semi-automatic pistols. He was frequently quoted as saying that the double action pistol was the solution for a nonexistent problem. 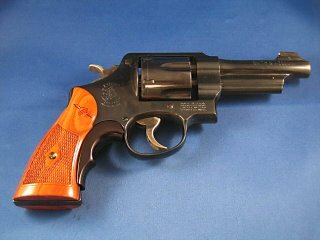 In getting back to the original story, while frustrated at the number of people attending Gunsite with double action 9mms like the Beretta 92 and the Smith & Wesson model 59, Cooper received a call from an interested future student who stated that he owned a .357 Magnum revolver and wanted to know if it was O.K. to bring the revolver to Cooper’s Academy. Cooper enthusiastically responded in the affirmative stating that a good .357 Magnum revolver was better than any 9mm pistol. In fact, Cooper’s affirmative statement probably began with an equally enthusiastic expletive. So today we look at two revolvers of which Colonel Cooper would probably approve. The first is the Smith & Wesson model 22 chambered for the .45 ACP and the second is the Smith & Wesson model 586-L Comp in .357 Magnum. 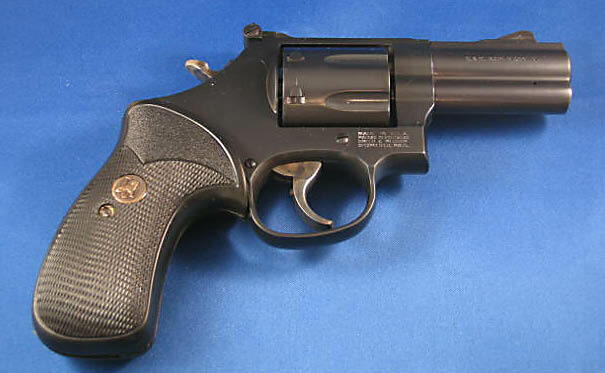 The model 586 is an offering from S&W’s Performance Center and features a 3 inch ported barrel and a front night sight. Both of these revolvers offer good combat accuracy, however neither are tack-driving Match-Grade handguns. Cooper would probably approve of this as well. 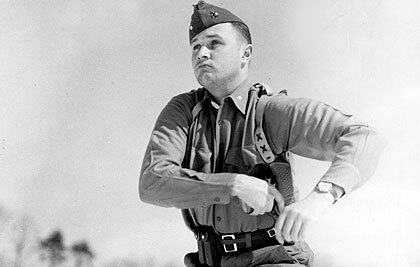 In one of the last columns published in Guns & Ammo prior to Cooper’s death last September the good Colonel remarked that people put too much emphasis on shooting tight groups and stated “If I was interested in shooting a tight group I would only shoot one round per target”. 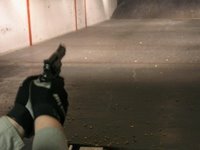 I have written about both of these revolvers before however they have been slightly enhanced since I last wrote about them. The model 22 is a reintroduction of the Smith & Wesson model 1950, which was a reintroduction of the S&W model 1917. The model 1917 was manufactured in response to General Blackjack Pershing’s desire for every soldier in WWI to be armed with a .45 ACP pistol. When jumping into one of the enemy’s trenches the .45 ACP pistol came in pretty darn handy. The only problem was that Colt could not produce enough of the 1911 .45 ACP pistols to meet Pershing’s needs. 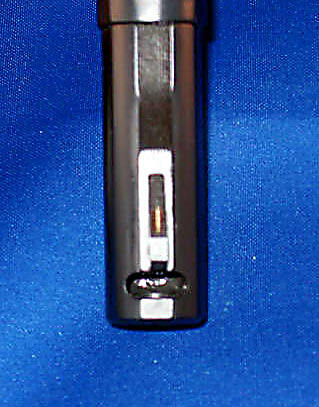 The Army turned to the two largest handgun manufacturers in the country and told them they could take all of the revolvers they could produce, however in order to keep logistics and supply lines simple the Army required the revolvers be chambered for the .45 ACP ammunition which was a rimless cartridge for use in semi-automatic pistols.  Both companies solved the problem by producing stamped-metal full moon clips that held the .45 ACP cartridges in the revolver’s cylinders and aided in the extraction of the fired rounds. Colt then began re-chambering their New Service model revolvers for the .45 ACP cartridge and Smith & Wesson re-chambered their Hand Ejector model for the .45 ACP as well. The designation for both companies’ revolvers became the model 1917. 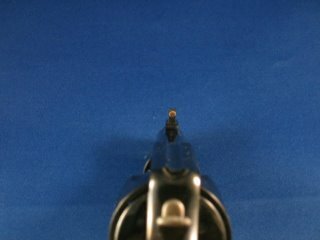 The enhancement made to this revolver since the last time I wrote about it was the addition of a gold dot front sight replacing the rounded “half nickel” sight on the original revolver. The gold dot greatly aids in faster sight alignment. 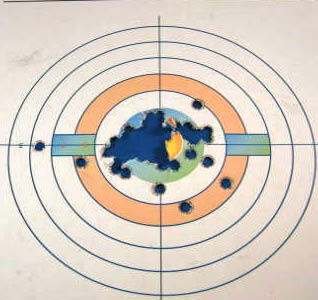 The first target was placed at 21 feet and fired upon with 25 rounds of Remington 230 grain FMJ ammunition. 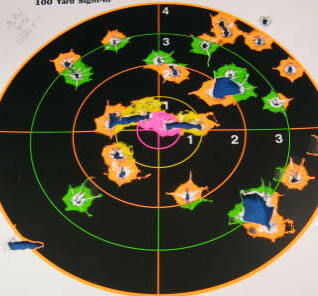 The second target was placed at 50 feet and absorbed 40 rounds of the same ammunition. Again, not exactly match accurate, but close enough for defending yourself against two-legged carnivores. One of the interesting features of the 586-L Comp is that Smith & Wesson was able to squeeze a 7th round into the cylinder so you can stay in the fight one shot longer. This revolver was a limited edition made for Camfour Distributors and featured a great set of slim rosewood boot grips. The only problem was that there was no place for my little finger and this was far from the best arrangement when shooting full power factory magnum ammunition. I replaced them with a nice-looking set of light cherry service grips augmented with a Tyler T-grip adapter. While better it was still not the optimal set-up for a magnum handgun. I finally found a set of Pachmayr rubber grips that fit the revolver and my hand extremely well. With these grips and the ported barrel shooting the full power magnum ammunition is no problem. 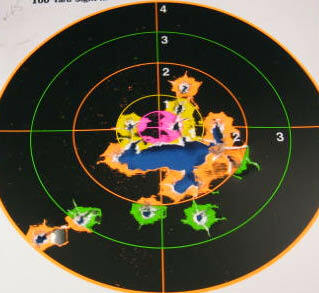 This target was placed at 21 feet and fired at with 50 rounds of Magtech 158 grain semi-jacketed soft point .357 magnum ammunition. So here’s to Lt. 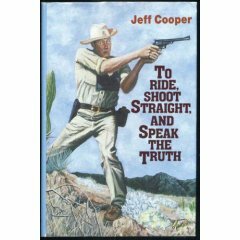 Colonel Jeff Cooper may you rest in peach and may your wisdom live on.